I met Alethia and Dave at a New York City location that I am convinced has the best sunset view of lower Manhattan, the Brooklyn Bridge. These two met in grad school and got engaged at Alethia's parents home in Canada over the holidays. Dave flew to Canada to surprise Alethia but the original engagement plan had to be slightly altered due to his delayed flight. After walking through security with 9 different signboards, finding a safe place for them on the plane, waiting for his delayed flight to take off and finally pulling up in a taxi to meet Alethia, Dave proposed in a 'Love Actually' style with the help of the 9 well-travel signboards. My insides practically melted when I heard their engagement story. Somehow, during their engagement session on the Brooklyn Bridge and in DUMBO, we managed to avoid the thunderstorms that were sporadically popping up that day. The only thing better than the views of New York City during their engagement were Alethia and Dave. These two glow with beauty, happiness and kindness. 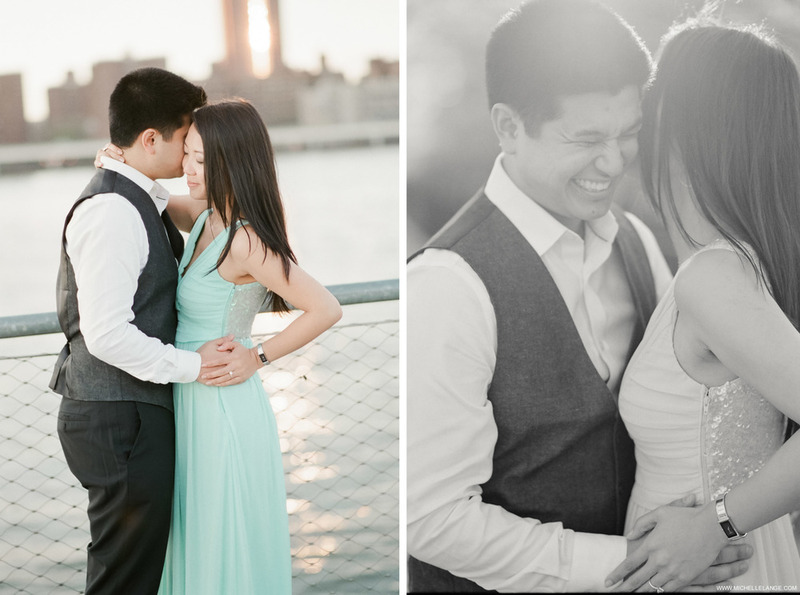 I cannot wait to document their romantic and whimsical wedding this Summer in New York.